So, last week we ran a Life Draft where we brought cards that were put into a pool and then we bid on each card individually. I chose to bring a Turtles Team that required all of the pieces to be together to function well. I decided this week that I would give that Team a go. The core of the build was left intact. April was there for early cost reduction. She would lead into Leo and Mikey who further reduced costs. Raph was for protection and Donnie was the main source of burn damage. Metalhead was the finisher. Since I fully restricted myself to the Turtles sets, I needed some ramp and removal options. Foot Ninja was included for the Swarm ability, but more importantly as a source of cheap Bolts. I decided on Unstable Canister as one of my BAC’s. This was mostly for the Global as I could ping out my Sidekicks for ramp and ping out ny opponent’s stuff. If the need arose, I could also buy the action outright and use the affiliation ability on it to further help with removal. Nefarious Broadcast was included as the other BAC in case of something like Bishtraction. That would definitely mess with the win condition. The final addition was Hamato Yoshi for not other reason than he fit the theme. Maybe his Global could be helpful if I was trying to push that extra bit of damage to an opposing character. So, the strategy was to buy cheap Turtles. Attack with Metalhead, and win with unblockable damage. Let’s see how it ran. Zombie Gladiator and lots of Mask characters were the main parts of this Team. April decided to roll out on level 3 right off the bat, making her hard to ping out. She led to the other discounters and I swung in with Donnie as much as possible until I could get Metalhead onto the Field. Once I did, I had burned him down enough to get enough damage across for lethal. Gladiator was a major pain as I had to keep something out to chump him or else I was going to take a large amount of damage. Battle Stacks and the Green Devil Mask were the major sources of pain here. I knew the GDM would be brutal for my Team, but I really did not have a play around it. I had to go through it and hope for the best. I built my board as before and managed to survive the first GDM strike by only losing a Sidekick or two. I kept the pressure on with Donnie as before. I managed to get Metalhead out, but was just a few points short of lethal. The GDM struck again and my Field weakened drastically. I became quickly outnumbered and could not survive the onslaught. Call Out and Overcrush (I love these two keywords together). Gord will be writing up the details on this one in his article. The short version is April failed me hard in this game. She came out once and I got a discount on Mikey. I paid full price for Leo and a Donnie. Eventually Leo and Mikey hit the Field making my purchases a little easier. I chose to let the Call Outs through instead of blocking a few times as the damage I would have saved by blocking was not really that good. Towards the end of the game, I had to make one of those Hail Mary type moves where I swung in with everything (mostly to get my weenies off board) and cleared out his Field. My only hope was that he would whiff some rolls and maybe I could survive another Turn. I was wrong. This Team is S-L-O-W. Handcuffing myself to sticking only with the Turtles cards definitely hurt me. The win condition is absolutely something that can work, but it really does need help from other things. First off, this really needs a better ramp engine. The discounts alone are difficult to pull off if April does not come out the first time. I kind of figured this would be an issue going in, but after running it… it is pretty obvious. I didn’t really have an issue with Unstable Canister as my removal option. I just would pick something better to pair with it next time. Chwinga is the first thing that comes to my mind here. Nefarious Broadcast was not really needed tonight, but it is a great piece to have in your back pocket. Bishtraction would have wrecked my Team worse than it already was. Hamato Yoshi really was a take it or leave it piece. In another build, I would put something more efficient and drop the theme. 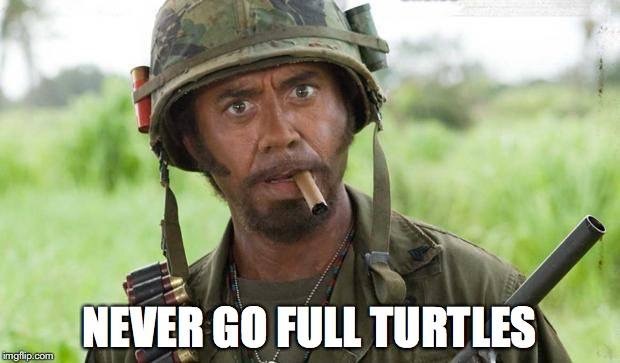 What have you done with the Turtles? Have you made them work staying only within their sets? Let us know in the comments below. Posted in Constructed, Dice Masters, Team BuildingcommentLeave a Comment on Turtle Power!